I was recently invited to do a SOTA presentation at the annual Bay-Net conference (BayCon). This was my first SOTA presentation, so I had to create it from scratch and (hopefully) refine it on my own prior to the conference. Fortunately, planning for this started several months ago, so I had plenty of time to get it together. It went well! I’m not sure of the exact count of attendees, but it seemed like it was somewhere between 100-200 people. It was held at the Plug and Play Tech Center in Sunnyvale, in their dedicated event space. It was a very professional setup, with two projectors, good sound, and a good layout. This was actually the first BayCon I was able to attend. It usually happens right on or around me and my wife’s anniversary and I’m not able to go! There were several presentations, starting with an opening/welcome by George, KJ6VU. He updated everyone on the status of the Bay-Net repeater system and activities. He also did some light-hearted pressing the crowd for cash, since the club had to invest in a lot of equipment last year. Following George’s intro part, Reilly K6YAP did a very informative Intro to DMR presentation. It was followed by a great Q&A period. George did some raffle giveaways after that, then it was my turn to speak! 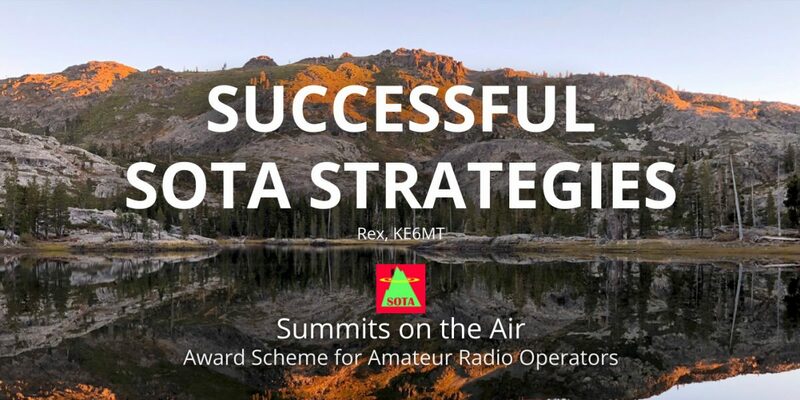 Here are the presentation slides: Successful SOTA Strategies – BayCon2019 – KE6MT. Now, I don’t do a lot of public speaking. In fact, this may have been my first time doing a big presentation. With the exception of trying to cram 60 minutes worth of info into 40 minutes, I think it went fairly well! I was hoping to have time for Q&A and a little bit of show-and-tell of my equipment afterwards, but I ran right up to (and possibly past) the clock. Nonetheless, it seemed well-received, with several people coming up to me afterwards, wanting to know more. Works for me! After my presentation, there were some more raffle giveaways. Then Paul KM6LH gave his “The Origins of Silicon Valley: Roots in Ham Radio” presentation – definitely not one to be missed. Following that, we broke for lunch. Doug’s talk was a very entertaining and informative finale, with a high-level overview of current QRP activities as well as a pretty hard sell for people to take up SOTA chasing as a favored QRP activity. Doug’s recently been quite active doing SOTA chasing with mostly portable operations. He recently hit the SOTA Shack Sloth award (1000 points) and kept on cruising. So he’s really loving SOTA and it shows. He didn’t have enough good things to say about it. After Doug’s talk, he did some raffle giveaways of some QRPGuys kits, then auctioned off two of his radios—proceeds generously going to Bay-Net. After seeing his amazing auctioneer skills, George KJ6VU decided to have Doug auction a couple of other items for Bay-Net. This was absolutely entertaining and fun—a great finish to the day.